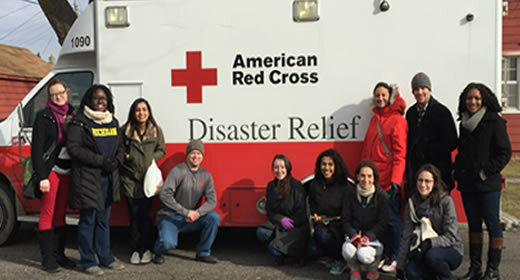 On Saturday February 6, nineteen Ford School MPPs volunteered with the Flint Red Cross to help with water delivery and outreach efforts in the wake of Flint’s water crisis. Students went door-to-door delivering water filters and cases of water and sharing educational materials with residents about the types of help available from local agencies. The students joined a robust and well-coordinated community response implemented by non-profit and government agencies. As of January 27, Red Cross volunteers alone had distributed more than 29,500 cases of water and 19,000 filters in the city.